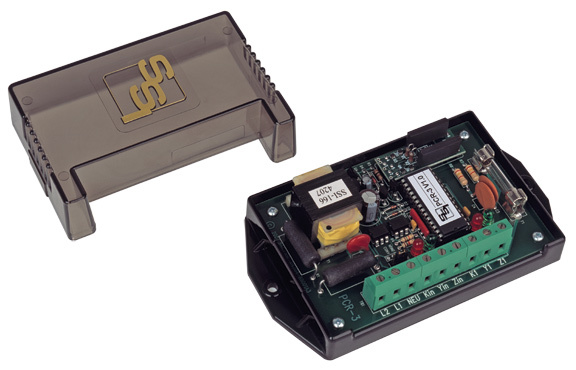 The PCR-3PS universal pulse conversion relay is designed to provide true 3-wire to 2-wire or 2-Wire to 3-Wire conversion in a single microcontroller-based relay. The conversion mode is field selectable and does not require the use of any special tools or equipment. The PCR-3 replaces both the PCR-1 and PCR-2 with one unit that accomplishes both modes of conversion. In the 3-wire to 2-wire mode, the PCR-3PS provides “true” conversion of each change of state of the 3-wire KYZ input circuit into a fixed 100 millisecond long 2-wire isolated output contact closure. The PCR-3 checks for the correct sequence of the input pulses before allowing an output pulse to occur. A K to Y input contact closure followed by a K to Z input contact closure will result in an output closure. A K to Y input contact closure followed by an interruption and then another K to Y contact closure will only result in an output closure for the first input closure. The second and all future K to Y input closures will be ignored until a K to Z input closure occurs. An input closure must be at least 20mS long to be recognized as a valid input pulse. In the 2-wire to 3-wire mode, the PCR-3PS provides “true” conversion of each change of state of the K-Y input 2-wire circuit into alternating changes of state of the 3-wire Form C isolated output contact closure. The PCR-3PS checks for the correct sequence of the input pulses before allowing an output pulse to occur. A K to Y input contact closure of at least 20mS will result in an output closure. The K to Y input contact closure must be open or interrupted for at least 20mS for the input to be reset and prepared for the next K to Y contact closure. An input closure less than 20mS is ignored. Typical applications include supervisory control (SCADA) systems, energy management systems and energy demand/KWH counters. Two sets of bright Red and Green LEDs lamps show the status of the input and output at all times, thus allowing a rapid visual check-out of the systems performance without the use of any additional tools or test instruments. The PCR-3PS’s input and output circuit’s terminal strip is “EURO” type connector strip. When the stripped wire has been correctly installed in the terminals’ “slot” no conductive parts are exposed on the surface of the terminal strip, thus allowing the user maximum protection from accidental electrical shock. The K lead of the PCR-3PS’s output is fused to prevent damage to the relay under almost any conditions a user might subject the system to such as excessive current, voltages, and incorrect wiring, etc. The PCR-3 has built-in transient protection for the solid-state relay’s contacts that eliminates the need for external or off-the-board transient suppressors. All component parts that have power applied to them, with the exception of the input/output terminal strip, are enclosed in a polycarbonate cover for maximum user protection. The mounting base plate is also made of polycarbonate and offers excellent electrical insulation. 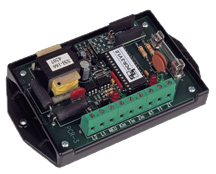 The PCR-32 is designed to mount in an electrical enclosure appropriate for the application and operating environment. Pulse Output: One set of dry Form C contacts (K, Y, & Z) for energy pulses. The contacts are solid state relays rated at 250 VAC/VDC @ 350mA. The maximum rating of the contacts is 100 VA. Factory fused at 1/4 amp @ 250VAC (3AG).